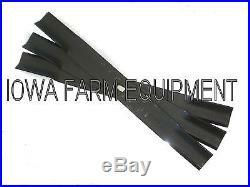 (3) Three HARD SURFACED REPLACEMENT BLADES For Y750R, 7' Farm King Finish Mowers. These HARD SURFACED BLADES Work Great! They Make A Noticeable Improvement For Cutting All Types Of Vegetation, Provide A Much Longer Overall Life And Longer Service Time Before Requiring Sharpening! These Are Farm King O. Blades - NOT After Market Products! Blades are 29-3/4" Long x 3" Wide x 1/4 Thick. Center Bolt Hole is 1-1/4" x 3/4" Rectangle. Blades Weigh About 6lb's Each! The item "3 HARD SURFACED REPLACEMENT BLADES for Y750R, 7' Farm King Finish Mowers" is in sale since Friday, June 02, 2017. This item is in the category "Business & Industrial\Heavy Equipment Attachments\Mowers & Mower Conditioners". The seller is "tractorparts247" and is located in Tipton, Iowa. This item can be shipped to United States.